I'm stuck behind a firewall so have to use HTTPS to access my GitHub repository. I'm using cygwin 1.7.7 on Windows XP. Is this a problem with my firewall, cygwin or what? I hadn't set the HTTP proxy in the Git config, however it's an ISA server that needs NTLM authentication, not basic, so unless anyone knows how to force git to use NTLM, I'm scuppered. Feel free to skip past this answer if you want to fix the certificates issue. This answer deals with tunneling ssh through the firewall which is IMHO a better solution to dealing with firewall/proxy thingies. There is a better way than using http access and that is to use the ssh service offered by github on port 443 of the ssh.github.com server. We use a tool called corkscrew. This is available for both CygWin (through setup from the cygwin homepage) and Linux using your favorite packaging tool. For MacOSX it is available from macports and brew at least. By adding this to the ~/.ssh/config this trick can be used for normal ssh connections. Hi ptillemans! You've successfully authenticated, but GitHub does not provide shell access. (Note: if you never logged in to github before, ssh will be asking to add the server key to the known hosts file. If you are paranoid, it is recommended to verify the RSA fingerprint to the one shown on the github site where you uploaded your key). A slight variant on this method is the case when you need to access a repository with another key, e.g. to separate your private account from your professional account. We've been using this for years now on both Linux, Macs and Windows. The problem is that you do not have any of Certification Authority certificates installed on your system. And these certs cannot be installed with cygwin's setup.exe. Actually install root certificates. Curl guys extracted for you certificates from Mozilla. cacert.pem file is what you are looking for. This file contains > 250 CA certs (don't know how to trust this number of ppl). You need to download this file, split it to individual certificates put them to /usr/ssl/certs (your CApath) and index them. Important: In order to use c_rehash you have to install openssl-perl too. WARNING: Disabling SSL certificate verification has security implications. Without verification of the authenticity of SSL/HTTPS connections, a malicious attacker can impersonate a trusted endpoint (such as GitHub or some other remote Git host), and you'll be vulnerable to a Man-in-the-Middle Attack. Be sure you fully understand the security issues and your threat model before using this as a solution. Note: disabling SSL verification has security implications. It allows Man in the Middle attacks when you use Git to transfer data over a network. Be sure you fully understand the security implications before using this as a solution. Or better yet, install the root certificates. This will prevent CURL to verity the HTTPS certification. Note I'm using an absolute path. 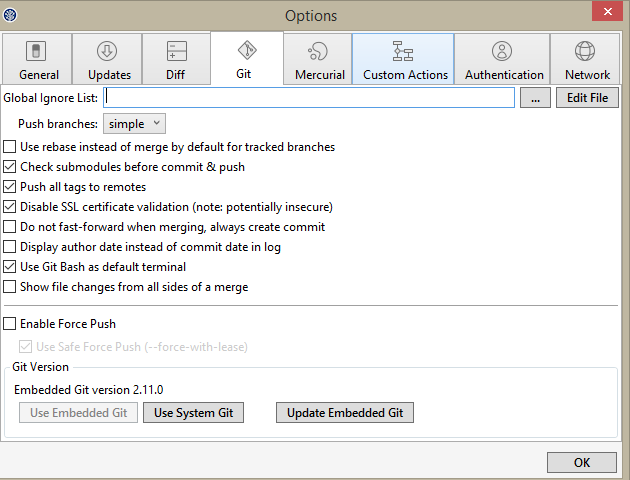 Git does no path expansion here, so you can't use ~ without an ugly kludge. Alternatively, you can skip the config file and set the path via the environment variable GIT_SSL_CAINFO instead. To troubleshoot this, set GIT_CURL_VERBOSE=1. The path of the CA file Git is using will be shown on lines starting with "CAfile:" in the output. Use git://the.repository instead of https://the.repository and will work. I've had this problem on Windows with TortoiseGit and this solved it. However, that last assertion is false (now, or always has been, I don't know). All you have to do is go to cygwin setup and include the package 'ca-certificates' (it is under Net). This did the trick for me. On CentOS 5.x, a simple yum update openssl updated the openssl package which updated the system ca-bundle.crt file and fixed the problem for me. The same may be true for other distributions. If you want to clone without borfing your global settings. (optional) Run c_reshash from the bash. Of course this only installs one cert hierarchy, the one you need for github. You can of course use this method with any other site without the need to install 200 certs of sites you don't (necessarily) trust. The share method is just an alias to /usr/local/share, and the curl-ca-bundle is provided by Mozilla. It's what you see being referenced in a lot of issues. Hope this helps as it's not very straightforward about how to approach this on Mac OS X. brew install curl isn't going to get you much either as it's keg only and will not be linked (running which curl will always output /usr/bin/curl, which is the default that ships with your OS). This post may also be of some value. Once you get homebrew installed along with the curl-ca-bundle, delete .curlrc and try cloning a repo out on github. Ensure that there are no errors and you'll be good to go. NOTE: If you do resort to .curlrc, please remove it from your system the moment you're done testing. This file can cause major issues, so use it for temporary purposes and with caution. brew doctor will complain in case you forget to purge it from your system). NOTE: If you update your version of git, you'll need to rerun this command since your system settings will be wiped out (they're stored relative to the git binary based on version). And you'll be all set. that's your tip that you need to tell git where the Mozilla ca-bundle is. .curlrc may or may not be the remedy to your problem. In any case, just get the Mozilla ca-bundle installed on your machine whether you have to manually download it or not. That's what's important here. Once you get the ca-bundle, you're good to go. Just run the git config command and point git to the the ca-bundle. export CURL_CA_BUNDLE=/usr/local/share/ca-bundle.crt to my .zshenv dot file since I'm using zsh. the git config option worked for most cases, but when hitting github over SSL (rvm get stable for example), I still ran into certificate issues. @Maverick pointed this out in his comment, but just in case someone misses it or assumes they don't necessarily need to export this environment variable in addition to running the git config --system.... command. Thanks and hope this helps. It looks like the curl-ca-bundle was recently removed from homebrew. There is a recommendation here. I've been having this same problem for Solaris Express 11. It took me a while but I managed to find where the certificates needed to be placed. According to /etc/openssl/openssl.cnf, the path for certificates is /etc/openssl/certs. I placed the certificates generated using the above advice from Alexey. The good thing about this solution is that it only takes effect in the current cmd window. Have you checked your time? I absolutely refused to make my git operations insecure and after trying everything people mentioned here, it struck me that one possible cause why certificates fail to pass verification is that the dates are wrong (either the certificate expiry date, or the local clock). I encountered the same problem to configure Git on a collaborative development platform that I have to manage. Get back the certificate of the authority which delivers the certificate for the server. Add this certificate to the CAcert file used by curl. On my server it is located in /etc/pki/tls/certs/ca-bundle.crt. On the client machine you must get the certificate and configure the .gitconfig file too. I needed the certificates just for Cygwin and git so I did what @esquifit posted. However, I had to run step 5 manually, c_rehash was not available on my system. I followed this guide: Installing CA Certificates into the OpenSSL framework instead. go to cygwin setup and include the package 'ca-certificates' (it is under Net) (as indicated elsewhere). I had the same issue. Certificate import or command to unset ssl verification didn't work. It turn out to be expired password for network proxy. There was entry of proxy config. in the .gitconfig file present in my windows user profile. I just removed the whole entry and it started working again. A simple "git push myRemoteName" worked great! I recently (Jul 2014) had a similar issue and found on OS X (10.9.4) that there was a "DigiCert High Assurance EV Root CA" certificate had expired (although I had another unexpired one as well). I found two certificates named "DigiCert High Assurance EV Root CA", one expiring Nov 2031 and the expired one at July 2014 (a few of days previously). Deleting the expired certificate resolved the issue for me. Not the answer you're looking for? Browse other questions tagged git ssl github cygwin ssl-certificate or ask your own question.